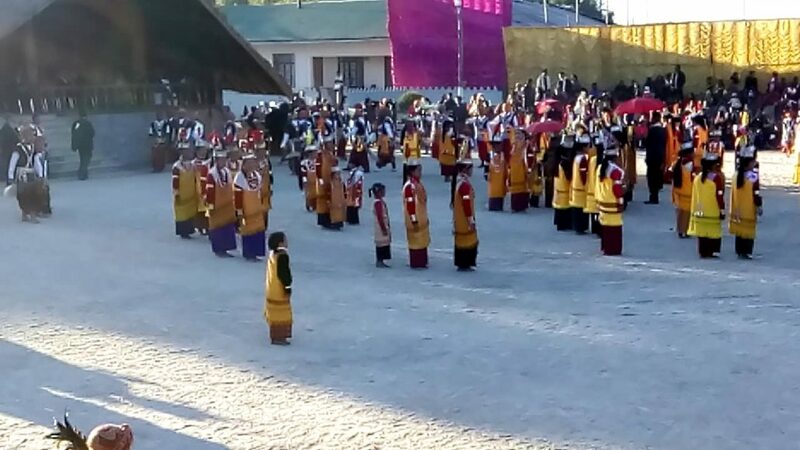 The ethnic annual festival of the Khasis, the Nongkrem Dance or Shad Nongkrem concluded at Smit, on the outskirts of Shillong in Meghalaya on Monday amid fanfare, gaiety and traditional fervour on Monday. Dancers both male and female including young boys and girls, dressed in traditional attire danced to the tune of the traditional musical pipe called tangmuri and local drums called ksing even as tens of thousands spectators including tourists, both domestic and international thronged the venue during the day to have a feel of this traditional festival. Traditionally female dancers perform Ka Shad Kynthei in the inner circle of the arena. Male dancers, however, perform Ka Shad Mastieh in the outer circle holding swords in their right hand, and a white Yak hair in their left hand while changing beats of the drums and pipes. Before dusk, the dance came to an end, which was followed by religious rituals as well as sacrifices of goats .The sacrifice of goat is an integral part of the ceremony, called Pomblang. The two-day festival is celebrated every year at Smit, the capital of Hima Khyrim, about 20 km from Shillong. Shad Nongkrem is held to seek blessings of the Almighty and offer thanks for showering blessings especially in the form of good harvest and welfare and prosperity of the people.